A4 Size 7.3 x 10.6 in. (186 x 269 mm) 8.3 x 11.7 in. A4 Mounted 7.3 x 10.6 in. (186 x 269 mm) 11 x 14 in. A3 Size 10.7 x 15.5 in. (272 x 394 mm) 11.7 x 16.5 in. SMALL 10 x 14.5 in. (254 x 368 mm) 12 x 17.25 in. MEDIUM 14.5 x 21 in. Hari Hari Hari Vahana is a composite form of Avalokiteshvara who is shown sitting above Vishnu, Garuda (Vishnu's vehicle), a white lion (Lokeshvara's vehicle), and the great nagaraja or serpent-king, Takshaka. This unusual five-tiered manifestation of Lokeshvara is one of the most popular forms of this bodhisattva of compassion in the Newar Buddhist tradition. The Sanskrit term Hari is a common epithet for Vishnu (Narayan), but the term can also be applied to an animal mount, such as a lion, bird, or horse. Thus the name Hari Hari Hari Vahana may be literally taken to mean the 'Lion (hari), Garuda (hari), Vishnu (hari), mount or vehicle (vahana) of Lokeshvara'. Essentially this composite form represents Lokeshvara as the supreme 'Lord of the World', the super-mundane Buddhist deity before who even Vishnu must bow in his role as the all-pervading protector of the universe. The three animal mounts represent the 'three realms', which are above, upon and beneath the earth, with Garuda being the lord of the skies, the lion the lord of the earth, and Takshaka the lord of the underworld. According to legend the origin of this deity dates back to the time when Manjushri first created the Kathmandu Valley by cutting through the encircling hills at Chobar Gorge with his sword, thus draining the great lake that had once filled this valley. The nagarajas, or serpent-kings, were furious with Manjushri for destroying their aquatic habitat, but eventually all but one of them - the great nagaraja Takshaka - were pacified by the bodhisattva Samantabhadra. With an irrepressible hostility Takshaka then began to slaughter many living beings, until he eventually contracted leprosy as a karmic consequence of his evil actions. 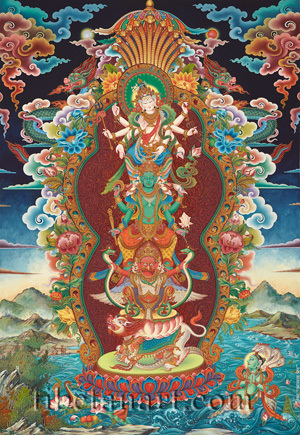 In great repentance Takshaka prayed to Avalokiteshvara for a cure, and through his compassion this great bodhisattva succeeded in pacifying the reformed Takshaka and curing him of leprosy. Then one day whilst Takshaka was basking upon the bank of the ever-receding lake Garuda happened to fly above him, and glimpsing this large and vulnerable serpent beneath his wings, decided to make a meal out of him. But Takshaka was an equal match for Garuda - the mighty king of birds, and soon they were locked into a vicious struggle, with Garuda losing ground as he felt himself being dragged into the water. In desperation Garuda cried out to Vishnu for help, who instantly manifested with his sharp discus raised to cut off Takshaka's head. In equal desperation at his imminent demise Takshaka likewise cried out to Lokeshvara, who suddenly appeared upon his white lion vehicle. The benign presence of Lokeshvara instantly caused all hostilities to cease, and bowing before the bodhisattva of infinite compassion, Vishnu offered his own divine form as a vehicle for Lokeshvara. Then Lokeshvara's lion offered himself as a vehicle for Garuda, while Takshaka offered himself as a vehicle for Lokeshvara's lion. And thus this composite form of Lokeshvara as Hari Hari Hari Vahana arose. In this original composition by Ram Prakash Shrestha, the five divine components of Hari Hari Hari Vahana Lokeshvara are portrayed in an innovative assembly, with the background landscape showing the receding waters of the Kathmandu Valley. The ornately scrolling and jeweled aura of this divine assembly is surrounded by a colourful array of symmetrical lotus flowers, clouds and fiery dragons. The discs of a silver moon and a golden sun appear on either side of the jewel-topped parasol that crowns this composition. And the five sensory offerings of a mirror (sight), a lute (sound), a conch full of perfume (scent), rolls of silk (touch), and jewel-fruit (taste), arise from the lotuses and leaves below the central lotus throne. Arising from the turbulent water in the lower right corner is the green form of the nagaraja Takshaka. His head is crowned with a crest of five hooded naga serpents, and his two hands are palms-folded in anjali-mudra as he holds a small lotus flower in front of his heart. Takshaka's serpentine tail coils from the water onto the golden sun disc of the lotus throne, where it is grasped in the claws of Lokeshvara's lion. This roaring and fiery white lion wears golden ornaments, bells, and a silk saddle blanket, upon which rests another lotus throne and sun disc that bears the squatting form of red Garuda. With his sharp talons and outstretched hands Garuda grasps two fierce naga serpents, the plumage of his wings spreading out behind him, and his powerful body adorned with all manner of precious silk and jewel ornaments. Vishnu sits above Garuda's upward-blazing and tawny hair, with his two feet resting upon the golden crests of Garuda's wings. Vishnu's green body is adorned with divine silk, gold, jewel and pearl ornaments, and his forehead is marked with a U-shaped tilak or urdhapundra. With his two right hands Vishnu wields his golden chakra and club, and with his two left hands he holds his white conch shell and lotus. Lokeshvara sits with his feet resting upon Vishnu's shoulders, and manifests in his white eight-armed aspect as Mahavajranatha, the 'Great Indestructible Lord'. He is lavishly adorned with all manner of divine silk and jeweled ornaments, including a golden tayo, a chained silver necklace, a flower garland, and a vajra that crowns his topknot. With his first right hand he makes the abhaya-mudra of protection in front of his heart, while his other three extended right hands hold a rosary, a trident, and makes the boon-granting varada-mudra. With his first left hand he holds a lotus-topped golden water-pot at the level of his hip, while his other three extended left hands hold a book, a rope-noose, and a pink lotus. Ascending above Lokeshvara's jeweled halo is a canopy of eleven hooded naga-serpents, each of which is crowned with a wish-granting gem and has a little golden pendant protruding from its mouth.